Don't think of it as a split. That's main point StarCraft II lead producer Chris Sigaty was trying to get across during our brief interview following the StarCraft II panel at BlizzCon where it was announced that the single player campaign would be delivered as three separate products - first Terran, then Zerg, and finally Protoss. "Effectively each game in the will be an expansion," Sigaty explained when I told him of our reader's initial concerns about buying the same game three times with a different single player component. Think Warcraft III's The Frozen Throne, or the original StarCraft's Brood War. Each new single player campaign will come with upgrades and changes to the multiplayer. The main difference here is that instead of giving you a tacked-on extension of the single-player experience as you often find in an RTS expansion, each title comes with a fully realized campaign.Chris explained that each of the three installments would play a bit differently as well, with different meta-game types in each. 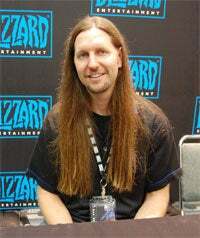 The initial campaign would feature Terran Jim Raynor, with a meta game that involves upgrading technologies. The second focuses on the Zerg, with a meta-element involving diplomacy. I mentioned Star Control, and Chris said that that sort of gameplay element had been discussed. So why the change? It really comes down to scope. "We always start with this really gigantic scope", Sigaty explained. Basically StarCraft II got bigger than they expected. They have a huge, solid Terran campaign that needs a bit of fleshing out at this point, and once you figure out the dev time needed for the other two campaigns it would have delayed the game for years. After months of discussion, this was their solution. So basically, as I suggested to Chris, instead of thinking of the StarCraft Trilogy as three separate courses, think of it as three different meals, each with a different flavor.